•	All visitors to the SuperDrug.com website will have a chance to save up to 57% off of their entire order, all by using coupon code “STARBUYERS” at checkout. This coupon code is limited in nature, so customers will need to act fast. •	Every week there are “Star Buys” on this site, giving customers the chance to save between 15% and 50% on different product categories every seven days. •	Free standard shipping is included with every order purchased from an email newsletter subscriber. Express and international shipping options are available, too. •	SuperDrug.com Rewards Card members earn points towards free gifts and discounts with every order. Superdrug gives customers the ability to browse through a variety of different health and beauty products that you can use to enhance your aesthetic appeal or to help rectify health ailments. On their website you can take a look at makeup, skincare products, fragrances, hair products, toiletries, items for baby and men, electrical items, health products, and more. They also have an online doctor that can help to give you medical advice and to find the right items that you may need for your particular ailment. Make sure that you browse through the sale section as the items that you may want to buy could be discounted. 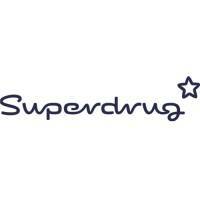 For most up to date offers check out Superdrug on Facebook and Twitter or contact Superdrug Support for any questions.